Over the ages, electronic technology was not getting promoted but when it has started it is getting higher and higher in the past we used telephone like land lines DSLs but when mobile was invented then a lot of other electronic products started to develop as now in modern era we are using mobile, tablets and laptops which are seeming like being installed in us. The electronic items are developed and are becoming more useful as well as software and applications too. 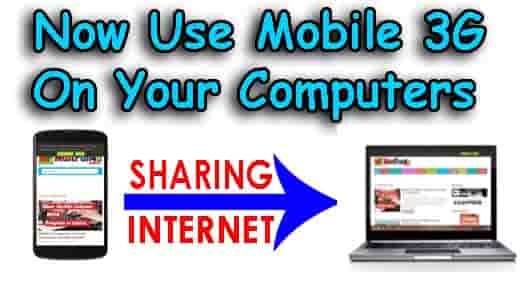 Means of connecting mobile internet on computer. The sources or means of using cell internet on PC are. 1) Via USB Data Cable 2) Via Wifi 3) Via Bluetooth. 2. Connect your phone with PC via data cable, wifi or Bluetooth. 6. Now you will see option like “USB tethering” used for connecting net via USB Cable, “Portable Wi-fi Hotspot” Used to connect net via wifi, “Bluetooth tethering” used for connecting internet via Bluetooth and “Setup Wi-fi Hotspot” used to change and set the wifi password because by using net via wifi will make your cell act like a wifi router. 7. The internet would be connected, Enjoy the Internet. Google play and iTunes both are developing applications and software which are used in these mobiles and tablets, these stores are over and over making a lot of apps even anyone who has skills in app development may make his own app and share on these store. These may are becoming source of earning as well because these have integrated advertisements. One of best benefit of android is that you can now use your mobile internet whether that is GPRS, 2G, 34 or 4G on your PC or Laptop means on any windows (Windows XP, 7, 8 and 10) or operating systems. Internet is the most required thing in this modern period so I think this post is would be the amazing and useful for all of you who read this I hope you have liked my post, for suggestions and comments use below box. and Remember: This is used for mobile to laptop wifi and this post is not for laptop to mobile wifi.